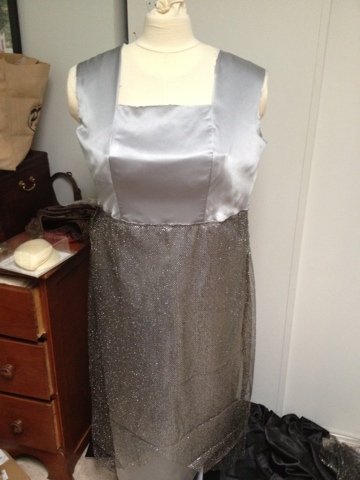 Well, I did get the over skirt done and attached, and I attached them both to the bodice, creating a dress-like thing. I also cut down the hook and eye tape that I got in hopes that I could make it less visible because it came on some gigantic backing. I also brought it and my corset to dinner tonight and had a try-on. It fits! Yaaay! I hope to get the sleeves created and fully attached tomorrow! Here's picture-proof of dress creation, though totally not in a state worthy of showing the world!